This catalog specializes in toys that encourage strategy, critical thinking, and other cognitive skills. 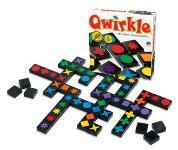 Standouts include Qwirkle (pictured), an award-winning game for the whole family, and original coloring books that feature three-dimensional, geometric, and kaleidoscopic designs. This fun company has a wide array of great toys, including science kits, a microscope set, art activities, blocks, and many hands-on toys that stimulate imagination and creativity. Not only does M n’ S have a vast selection of Montessori-type materials (matching cards, objects, and animals for sorting and classification), but they also have wooden toddler and preschool toys, as well as hands-on activities for astronomy, geology, and biology. This store has a lot of great nature items that you can’t find anywhere else, including materials for studying animal tracks, life cycles, the seasons, and weather. My kids love the 2-way magnifying viewer and the animal puppets. Browsing the Museum Tour catalog or website is like walking through the world’s largest museum gift shop. Amazing toys, games, and activities of every kind are featured. Topics include space, physics, architecture, and history. I’m partial to the ArchiQuest creative building system (pictured) which features wooden blocks printed with beautiful detailed designs inspired by architecture around the world. This catalog features beautiful, high-quality toys and activities. 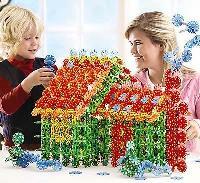 I love the award-winning Connectagons building set (pictured) and a wide array of science kits and activities. This perennial favorite of Montessori schools worldwide features all the “stuff” that makes Montessori classrooms such a feast for the senses. Colorful mobiles, wooden rattles, and tiny chairs are part of the delightful offerings for 0-3; educational posters, art cards, and books about the history of language and math are featured in the 6-12 catalog. They offer some of their products for online purchase, and you can request a catalog to see their full line of products. This catalog emphasizes hands-on, intriguing toys and activities that make science fun. 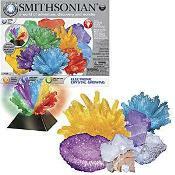 I like the Smithsonian Crystal Growing Kit (pictured) and the Snap Circuits Alternative Energy Kit. This helpful catalog has everything you need to make your house a Montessori home. From tiny pitchers and vases to child-size brooms, gardening tools, and aprons, everything is high-quality and supports the Montessori philosophy of independence. Any more great places to shop, or ideas for fantastic educational gifts? Please share! Just a note: I have not been compensated in any way by any of these companies. I’ve ordered from each of them, many more than once, and have always been pleased with the products and the customer service. If you have questions about products, shipping, or availability, please contact that specific company directly through their website.